If you know me, you probably know that I am a whisky drinker. Had you asked me eighteen months ago I would have said I am a scotch drinker, but that changed when Michael Kulwicki joined the Rakuten End User Technology team in October of 2013. Michael is Scottish, but is living in Tokyo with his wife Noriko. He joined the EUT team and we worked very closely together for the next three months. During that time we became friends. Although it is easy to think that we were the only two Anglo-Saxons working at a Japanese company and so we naturally hung out together, that would be a wrong assumption. We had a lot of common interests, ranging from IT to James Bond and other literature to – you guessed it – scotch. Being married to a Japanese woman, and having lived previously in Japan teaching snowboarding, Michael has several distinct advantages over me, not the least of which is that he speaks Japanese, as well as reading it. He reads and writes it, and when we were out and about he was an excellent companion for many reasons, one of which was his ability to translate the world in a country that is quite unilingual. Knowing that I enjoyed scotch, he started talking to me about Japanese whisky, from the history and how a gentleman names Masataka Taketsuru (and his Scottish wife) brought the whisky-making process to Japan, to different distilleries and expressions available to us today. We made sure to look for decent bottles whenever we were out and about, and we found quite a few. The best of the expressions that I would eventually discover though was not with Michael, rather at one of the myriad Duty Free Stores at Narita International Airport. These stores will allow you to sample several of the whiskies that you are considering, which is, for someone like myself, a very smart way to get my business. You see, I am always loathe to buy a bottle for ¥8,000 (at the time around $75) blind for a bottle that I might love… or not. 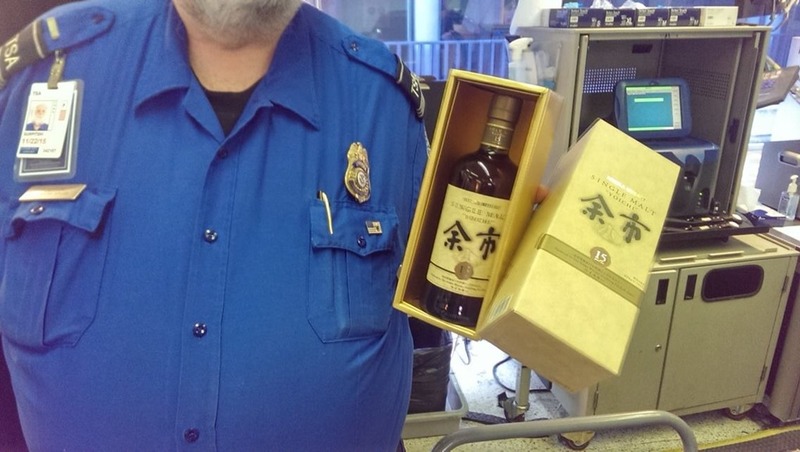 And so it was on my way home to Canada that I first experienced the YOICHI 15 year old expression from Nikka Whisky. It is, in my opinion, the best whisky that I have had for less than $100 for a litre. In January I started a new contract back with Rakuten, which was very exciting for several reasons – not the least of which that I would once again be working with Michael. The first day of the contract found the both of us landing in Seattle for a week of meetings at Microsoft. Not one to miss out on an opportunity, I asked him to bring me a bottle, and of course he did. However the bottle (pictured above) is not what touched me, not what I will treasure forever. Michael and Norkio frequent a bar in Tokyo where the bar allows you to buy a bottle of your favourite spirit, and they will keep it for you. They would put a name tag or label on the bottle I suppose, and when you came in they would pour it for you. I don’t know all of the specifics, but it sounds simply marvellous to someone like me who does not usually go in for the whiskies that most bars keep on hand. I promise you the next time I am in Tokyo I am going to try to go to this bar though to experience it for myself. At some point, it would seem, the bar owner decided to make special name plates for his patrons. He cut a piece of wood, painted (caligraphied) the patron’s name on it, then ‘’chopped” it – signed it with his personal stamp. Noriko and Michael asked if he would make one with my name on it, and he did. When I opened the box that contained the whisky, the name plate was around the neck of the bottle. I was thrilled to get the bottle, don’t get me wrong. While I do not drink a lot or often, I am very happy to have the bottle back in my bar. However bottles come and bottles go… this name plate means so much more to me than that, and it will be with me for a very long time to come. Now, for those of you wondering “What if it doesn’t really say Mitch?” I have a simple way of being sure. When I was in Japan I asked someone to type my name in Japanese so that I could add it to my e-mail signature. Even for the year I was not working with Rakuten, I maintained it… I thought it was a nice touch I suppose. So when I was back in my hotel room I went to my Outlook and I checked. Sure enough: ミッチ. The characters matched up perfectly! Of course, even if they didn’t, I would keep it… I just not plan to display it prominently on my ‘bottle of honour’ for the rest of my life! Thanks Michael, and thanks Noriko. This means so much more to me than the bottle or anything else I got in Japan. It is personal, it is meaningful, and there is a story behind it that I will never forget. 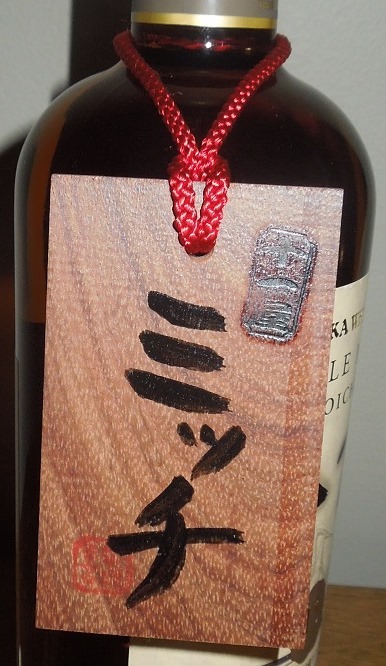 Of course, Michael did not only bring the single bottle to Seattle; he brought one for his own enjoyment as well: A Taketsuru Pure Malt 21 Years Old. Although it is a pure malt (malt whisky from several distilleries vatted together) it was still excellent, and when I am next in Japan I am not sure that I won’t bring one of these back. I’m not sure yet, because there are a few others I want to try… probably the Yamazaki or Hakushu Distiller’s Reserve or the Single Malt Miyagikyo 15 Years Old. We’ll see, I have a few months before that trip so I have time to decide. And with that, my friends, I think I am going to pour myself a drink! Enjoy your week.